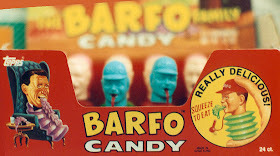 D R E W • F R I E D M A N: The Barfo Family, "It's more than just a gag!" The Barfo Family, "It's more than just a gag!" designed by Drew Friedman, box painted by Patrick Pigott. 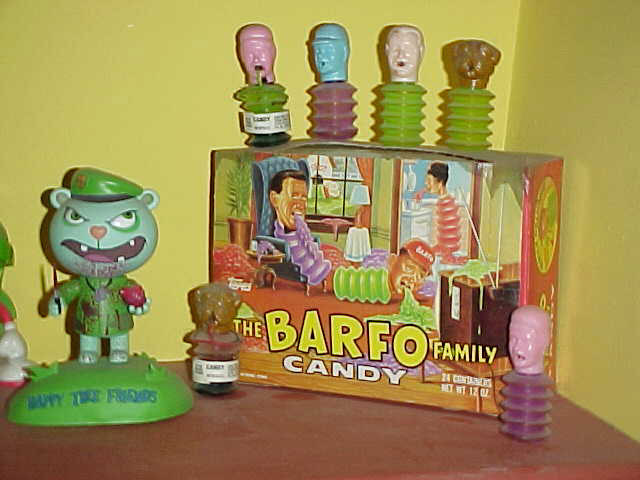 The Barfo Family Candy was unleashed by the Topps bubblegum company in 1990. 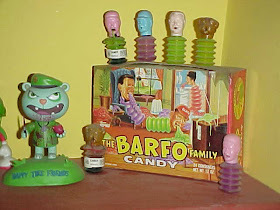 The armless & legless torsos featuring an unhappy, nauseated, white bread family, with their heads mounted on accordion-like shaped bodies containing a delightful glop- like gel/"candy" (ingredients: sugar, water, glycerin, gelatin, citric acid, potassium sorbate, artificial flavors, artificial colors), are still fondly recalled by vomit novelty toy and candy afficianotos. 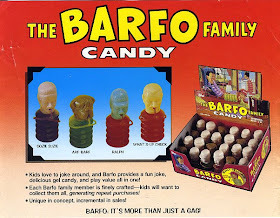 Barfo was a collaborative effort of Topps' new product development department, the original notion hatched by veteran candy man Abe Morgenstern, who arrived at Topps one morning in Brooklyn with a Thanksgiving turkey baster demanding to know: "How can we turn this into a candy container?" 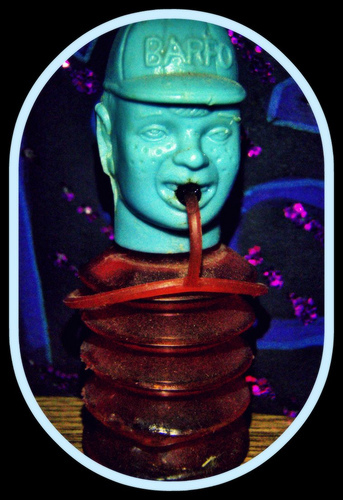 Mark Newgarden suggested a vomiting head, and The rest is history. 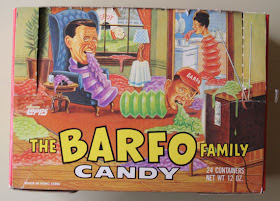 As journalist Patrick Rosenkranz chronicled in "The Bubble Gum Wars": "The concept that couldn't be ignored, The Barfo Family quickly became a legend in their own time." 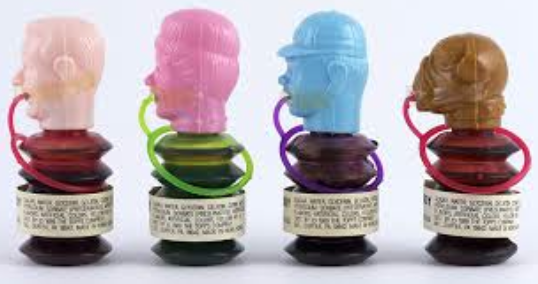 Based on Newgarden's suggestion, Morgenstern had a prototype sculpted in China and sent to Topps: This weird, Charles Burns like fellow sporting a plug in his mouth, to presumably hold in the "candy". 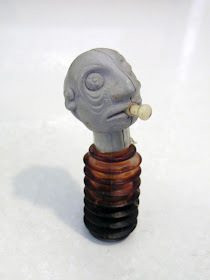 Close up of the lovely prototype. 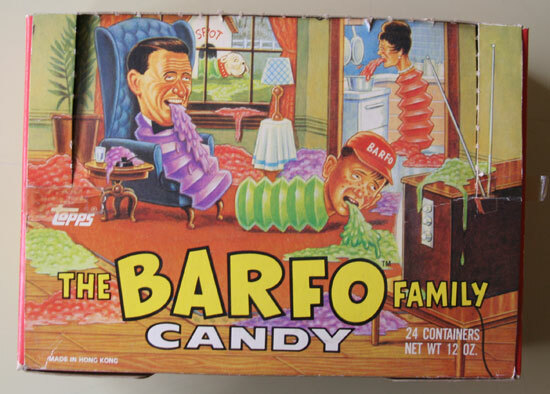 "BARFO, IT'S MORE THAN JUST A GAG!" 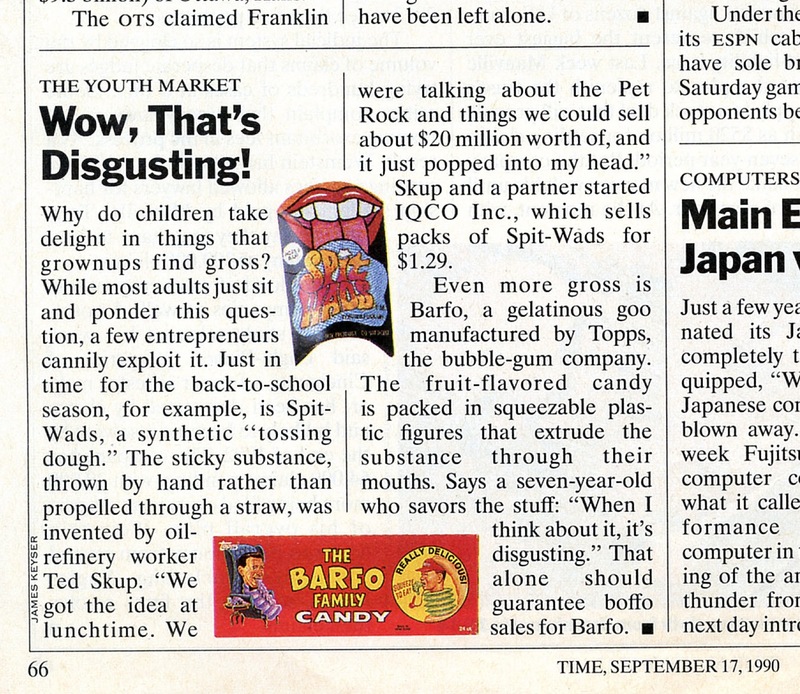 Barfo publicity sheet sent out to candy distributors by Topps. Whoever wrote this copy decided to give the family silly "gag" names. 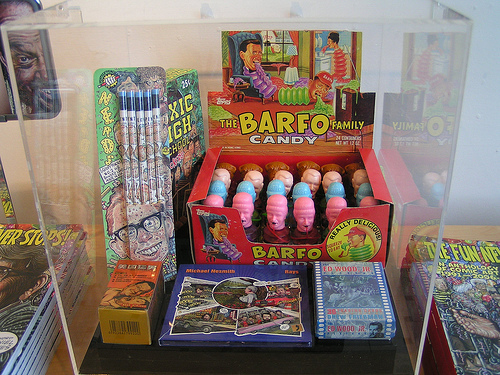 This was a recent display at the Fantagraphics gallery in Seatlle containing some of the products I've designed over the years, including my pride and joy, Barfo. This is the finished box art (click to enlarge), painted by Patrick Piggot. Abe was delighted. Rest in Peace's Abe! Thanks to Mark Newgarden for supplying some of the images and Alan Nahagian. Nice job! 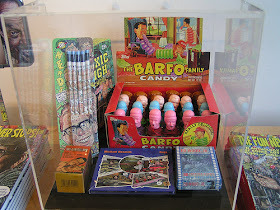 Glad to see Nerds pencils made the cut. Warped my brain as a kid. 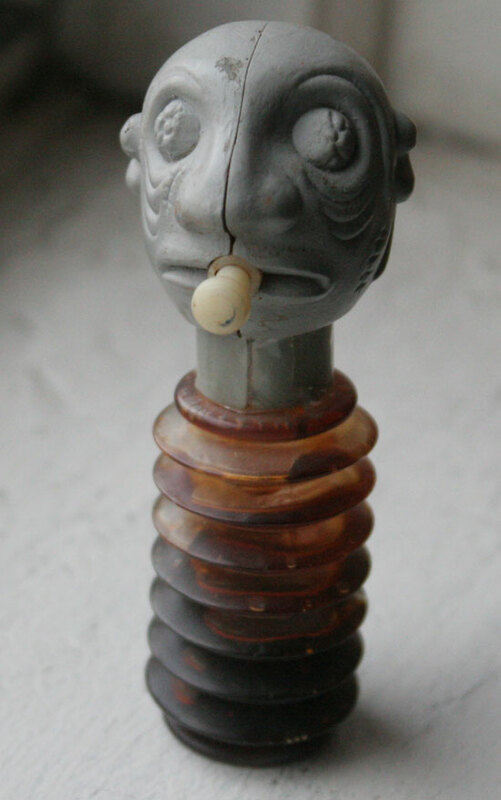 I'm a little weirded out seeing this collection in a vitrine like relics of the true cross. Especially since it mirrors my own Friedman shrine (sans the elusive Barfos)Is that box on the left the Chinese bootleg Viagra with Penn Jilette on the front? But what's the CD looking thing in the foreground? I'm hoping "Toxic High" gets a post of its own soon. And can one of you Topps alumni tell the internet who gets credits on "Dinosaurs Attacks"?? "Dinosaurs Attack" was Gary Gerani's baby. Mark & I didn't work on that one. 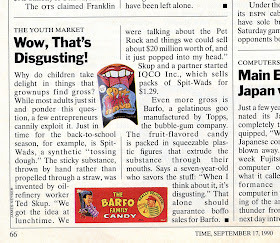 At the time, Mark was busy working on "Garbage Pail Kids", & creating "Toxic High" with me.